When Jennifer Crowson was considering a Montessori school in Dundas, Ont., for her son Max, now 5, the school told her there was no way it would provide transportation for him. That’s one reason she enrolled him. “They said, ‘Absolutely not. We want our children and their parents to meet each other and mix at the end of the day.’ I was surprised, but now I see their point,” says Ms. Crowson, a social worker who lives in the Dundas area. Ms. Crowson and her husband – and Max – liked the Montessori program so much that this is the third year that Max will attend Dundas Valley Montessori School, and he’s being joined this fall by his brother, Ruaridh (pronounced Rory), 3. Montessori is different. The program, which follows the philosophy of founder Maria Montessori, attracts many families and inspires many educators, at the same time as its differences can challenge provincial curriculum officials. On the one hand, it’s based on independent learning, on students’ interaction with their surroundings and the opportunity for students to pursue ideas and subjects that interest them for long, uninterrupted blocks of time. On the other hand, Montessori programs can have large classes and minimal direct instruction by teachers, and they mix kids of different ages who would ordinarily be in as many as three separate grades. It doesn’t fit neatly within the rigours of public school curriculum guidelines, so it has its own system of training teachers and accrediting Montessori schools. These aren’t problems, they’re features, says Tony Evans, director of Dundas Valley and a former Montessori student himself. The central part of the Montessori philosophy is to encourage children to learn on their own. “If you’re driving the bus yourself, you’re going to take it farther,” Mr. Evans says. Montessori education was created in the early 1900s by Dr. Montessori, one of the first female physicians in Italy. Working in a poor part of Rome, she opened a “children’s house” and built a school program on the idea that children learn by working independently. Children at Montessori schools use whatever materials are at hand to learn, as well as specialized, hands-on, tactile learning materials. The key is emphasizing the teaching moment. They study in mixed age groups, and the way they learn is perhaps more important than the information – learning styles follow the developmental patterns of formative brain growth that take place in childhood and adolescence. “We see it as an individualized approach to education from toddlers to high school,” says Katherine Poyntz, executive director of the Canadian Council of Montessori Administrators (CCMA), which oversees teacher training and accreditation of Montessori schools in Canada. Ms. Poyntz says that education ministries in British Columbia and Alberta have brought some aspects of Montessori education into certain public schools. But in most of Canada, Montessori programs are not incorporated into the public system. The result is that Montessori operates as a kind of stand-alone school system, training its own teachers at institutes in British Columbia and Ontario and accrediting its own schools through the CCMA, headed by Ms. Poyntz. “We run a nine-month course, with about 28 student teachers, and a shorter course for early childhood training,” says Caroline Loughran, administrator of the Vancouver Association Montessori Internationale teacher training centre. The difficulty is getting around practical requirements such as pupil-teacher ratios or classes with more than two grades. Montessori’s popularity is undiminished. “Looking back on my own elementary school experiences, I wish that I had the opportunity to be a Montessori student,” says Justin Hogeterp, a software developer who has two children at the Dundas school, where tuition is approximately $10,000 a year. There are about 500 Montessori schools across Canada, roughly half of them in Ontario, among some 22,000 in the world. This fall in Ottawa, Canada’s first Montessori secondary school, The Element, is opening. The school, in the capital’s Alta Vista neighbourhood, will have about 90 students from grades 10 to 12, most of them previous Montessori students in lower grades. Tuition will be about $15,000 a year and the school will be run as a not-for-profit organization, meaning that funds go to operating and improving the facility. Is Montessori for everyone? Its proponents speak about the method with near religious zeal, but nevertheless, Ms. Poyntz says it’s important for parents and children to see a Montessori school for themselves before deciding. The most important question to ask, Ms. Poyntz adds, is: “Are the children engaged in and enjoying what they’re doing? If you visit a Montessori school, or even one that uses similar methods, you’ll notice differences from more traditional classrooms. Pupil-teacher ratio. In public schools and many private schools, these are set rigidly to ensure that classes aren’t too large. By contrast, founder Maria Montessori herself said that a minimum class size of 28 students is optimal, with one teacher. “It’s about what the student is learning, not what the teacher is telling them,” says Tony Evans, director of Dundas Valley Montessori School in Dundas, Ont. Students look to topics and materials that interest them, while other students as well as the teacher are there to help and guide. Mixed ages. Putting students who would normally be in up to three different grades in the same room is normal procedure in a Montessori school. 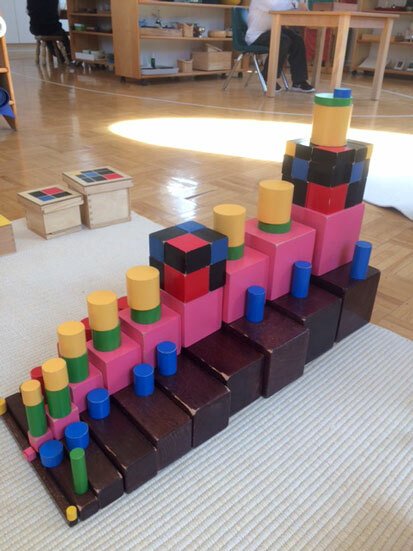 Montessori schools also use sets of dedicated materials in the class – objects and shapes, games, etc. Students working together, uninterrupted working time. Montessori schools like to provide uninterrupted working cycles of as long as three hours for children between 2 1/2 and six. In the new Element high school in Ottawa, students will collaborate on work in one part of the class while the teacher gives a lesson to a small group in another part, says Pat Gere, the school’s executive director. Following developmental stages. Montessori educators pay close attention to the early learning brain development patterns that were studied and reported on extensively by the internationally revered Canadian child development expert Fraser Mustard. In practical terms at Montessori schools, that can mean focusing on personal changes in early years, from losing baby teeth to discovering bike riding. In early adolescence, children open up to the world and want to know about everything – space travel, history, physics, dinosaurs and so on. In the teen years the focus can shift to developing personal relationships, working with others and decision-making. Montessori proponents point to research showing that this type of education does a better job developing the executive function in students than traditional schooling. Montessori schools are sometimes confused with Waldorf schools, which have some similarities but some key differences. There are about 3,000 Waldorf schools and kindergartens in 80 countries, says Ryan Lindsay, board president of the Waldorf School Association of Ontario. Waldorf schools follow the philosophy of Rudolf Steiner, who lived from 1861 to 1925. Like Montessori schools, Waldorf schools use brain research and parent-teacher-student collaboration to provide a multitude of physical, social, aesthetic and intellectual experiences. Tuition at Waldorf schools in Canada varies – it tends to be cheaper in Western Canada and can be up to $17,000 a year in Ontario. There are many subtle differences between the two systems. Several big ones: Waldorf schools put much more focus on having teachers teach the students rather than Montessori’s student-centred approach of having the student decide what to learn and the teacher as guide. Also, Waldorf schools tend to discourage reliance on technology, at least until upper grades, while Montessori leaves this decision more to parents and children. Both methods emphasize creativity and imagination.